Hello. We’re delighted you could join us. We’d like to recognise that; we’d like to say hello. We are REMOTE. We are here to help you be more like people like you. Imagine you’re in a theatre of the future, powered by an algorithm. REMOTE is an interactive live game interrogating the politics of choice, and decision-making in an immaterial world, saturated with technology. This is a piece of game-theatre that you play sitting down, and its entirely led by you, the audience. As well as just being yourselves – you are also, together, playing a character, and you’ll be asked to make choices for her. 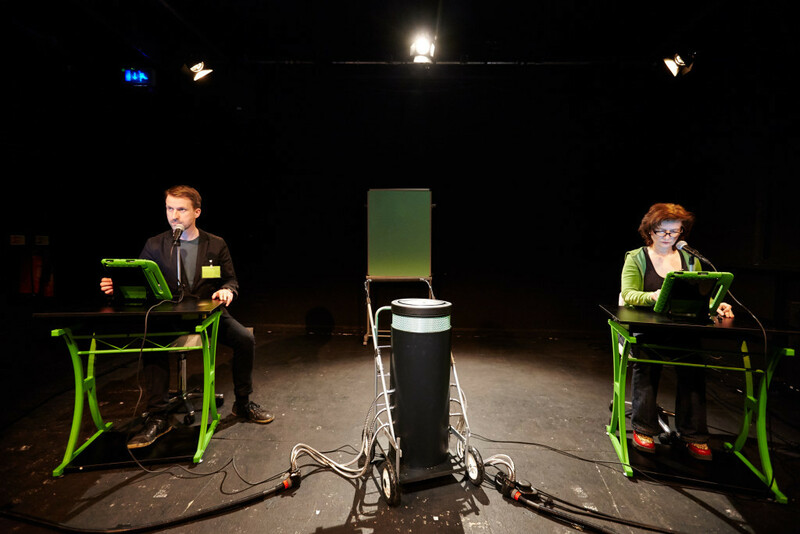 Fusing an interactive script with a live and responsive sound design – REMOTE is a mechanical theatre game. It’s 2016, and we’re a room full of mostly strangers, imagining the future. Sound Design by Kieran Lucas available on soundcloud. REMOTE has been commissioned by Theatre in the Mill, supported by Camden People’s Theatre, and developed through scratch and residency at CPT, BAC, MAKE Ireland, University of Exeter, and Theatre in the Mill. Joe Ball, Will Duke, Annette Mees, Tom Bowtell, Kai McGilligan Oliver, Flora Wellesley-Wesley, Melanie Wilson, and Roz Wynn – who all took part in previous development of Codename: REMOTE. Iain Bloomfield, Annie Dorsen, Matthew Hawn, Stewart Laing, Brian Logan, and Florian Malzacher for dramaturgical conversations. Amber Massie-Blomfield, Anna O’Dell, Brian Logan and the team at CPT; Iain Bloomfield, Ivan Mack and the team at the Mill. Thanks also to all our backers on Kickstarter for helping us make it.